Obi is not the new brand in India; the company had been in India for a year now when they announced their handsets under Obi Mobiles brand. Now the company has rebranded itself as the Obi Worldphone and has launched two new handsets; SF1 and SJ1.5, in August this year. Now the brand has launched two variants of the SF1 handset in India. The large difference between these variants is in RAM and internal storage only, as one comes with 2GB RAM and 16GB internal storage while other is launched with 3GB RAM and 32GB internal storage. We had the pleasure of using the 2GB RAM variant. We had spent a week using the SF1 smartphone as our daily driver and below is our detailed review based on that. The most astonishing thing about this handset is its design. Some would say it is the fusion of a Nokia Lumia handset with any nicely designed Android phone. But when you see the box unit it comes in, you’ll have the feeling that you’re looking at an iPod Touch. The beautiful device comes in a transparent box, which makes it stand unique among the crowd. We have unboxed many handsets, but it has been a long time since we unboxed a device coming in such packaging. You can see the dedication of company towards design elements that they have worked quite a bit on the packaging itself. Coming to the design of the device, it comes with a unibody design that is unique in its sense. With flat surface on the back and floating display on the front, the device somewhat has weird looks, but in a good way. Not your traditional hardware either, the Obi Worldphone SF1 have a flat top edge that houses dual microphones and an Audio Jack. While the bottom edge is rounded and houses microUSB port in the center of dual Dolby enabled loudspeakers. I must say, they’re quite clear and extends sharp sound levels to a distant perimeter. Usually, I don’t prefer the volume rocker and power buttons on the left edge but it would have been a traditional design language if the company has offered those buttons on the right edge. And that’s not what company wanted to achieve here. Designed in San Francisco and Made in China, the Obi handset is not your usual Android phone. On the front, it has an interesting setup, the display seems to be floating over the device, or in a weird way it looks like a Lumia handset is overlapped with a display of an Android handset. The bezels and extra side parts take up a lot of space and thus make it quite a large device for a 5-inch screen. It isn’t the most compact handset in its screen size category; there are no capacitive buttons despite giving quite the room on the bottom bezel. While the top bezel makes good use of space as it houses an earpiece, set of sensors, camera module, and an LED Flash. Overall, it is the most uniquely designed smartphone, which is beautiful and would easily attract the surrounding eyes. This can be a style statement for consumers. A smartphone priced at what Obi SF1 is priced is just amazing. Earlier, the poster boy in this range was Xiaomi’s Mi 4i, but now I easily see this handset taking over that space. The Obi Worldphone SF1 packs a full HD (1080p) display, which offers a pixel density of 443 PPI (Pixel Per Inch) and it is huge. It isn’t a Super AMOLED display, but the JDI In-Cell IPS technology results in good outcomes. This display is certainly the example of that you don’t always need an AMOLED display to satisfy the needs of having a stunning quality. What’s more interesting is that there is Corning Gorilla Glass 4 Protection on the floating display attached on the front of the device. It’s quite responsive concerning touch sensitivity despite the glass protection on it, if that’s what you’re worried about. And it’s not a fingerprint magnet either, thanks to the Oleophobic Coating. This coating keeps your fingerprint at bay and thus not adhering to the glass. So, a simple wipe with a soft cloth should make the display look like a brand new. The color reproduction is pretty sweet; we watched Full HD videos with high color variations, and they look stunning with no doubt. Coming to the viewing angles talk, it is good as well, but when you put this device under sunlight the reflective nature of display dominates and its little bit hard to see content unless you’re at a right angle. But overall, this is the best display you could ask for in a mid-range segment. There is a customized Android skin on Obi SF1, but it still reminisce the looks of Stock Android. That’s the beauty of such Android skin, even after changing appearance of the home screen, settings area, and a grid style, they still give a feeling of Stock UI. The Android skin on this device is based on the Android Lollipop 5.0.2, which is not the latest version of Lollipop OS. The first advantage of having elements of stock Android is you get an app drawer unlike most of the Chinese interfaces. This device might be made in China, but the heart and soul lie in the United States as it was conceived in California. When you first wake up the device, you notice an intuitively designed circular lock screen. It houses three functions; the Dialer, Home Screen, and Camera app. With nice animations, you could jump to any of the three functions from the lock screen. Once you go to the home screen, you would be welcomed with a home screen called Obi Lifespeed, which is apparently the name of Obi’s UI Style. The device doesn’t come with many pre-installed apps, but it rather comes with resourceful apps only. The system has apps like Obi care, ColorNote, File Manager, Email and voice dialer app that can be quite resourceful at times. The one unique app that it comes with is called Sweet, it finds the best offers for shopping, dining and going out in the city, based on the interests you give it to the app while signing up for the service. There are some more useful apps like Swiftkey and Microsoft apps like Word, Excel and PowerPoint pre-installed on the device. The interface is all good in terms of looks and pre-installed apps, although, the pressing matter is the slow animations. The interface isn’t as smooth as it should be with such powerful processor. Maybe it’s the old version issue, or maybe the company hasn’t optimized the animations, there seems to be a big noticeable break while navigating on the interface. And especially during multitasking, the slow nature is experienced. We only hope that brand addresses this issue via future software updates. The Obi Worldphone SF1 comes in two variants; the first model has a 2GB RAM and 16GB internal storage, the second model has a 3GB of RAM and 32GB internal storage. We would have loved the latter variant, but the handset we are reviewing is a 2GB variant. The device is powered by a Qualcomm Snapdragon 615 chipset that is an Octa-core processor and thus supports the 64-bit architecture. It clocks at 1.5GHz and has a support of Adreno 405 GPU. The SD 615 chipset is termed as the mid-range powerhouse, and the processor delivers the performance as advertised. 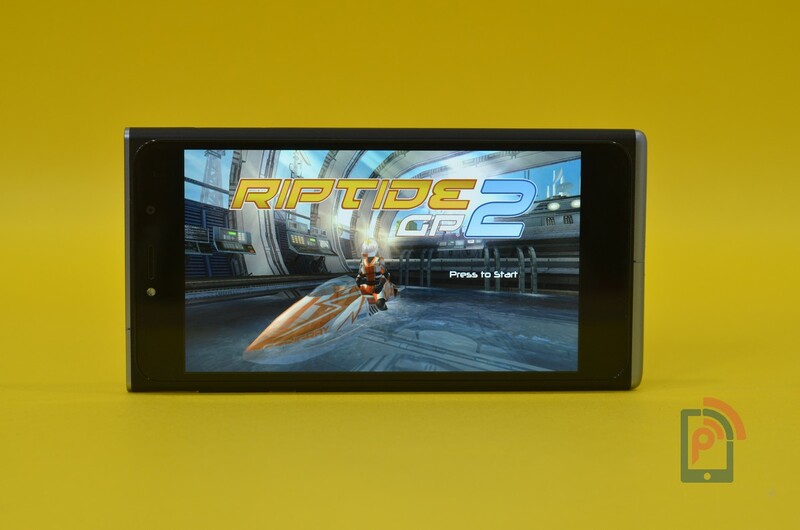 We played games like Riptide GP2, Dead Trigger 2 and Asphalt 8, all these games were pretty smooth and didn’t have a lag. But do make a note that when we opened all three games and tried switching in the middle of the running game, it was barely possible for the device to do so. Though, I blame the software for that as it is not polished for performance. The processor is not at fault for performance, but rather it is to be blamed for the massive heat production during the gameplay. It’s hard to ignore if a device heats up to 44 degrees within couple minutes of gaming. Although, it was surprisingly cooling down fast and that is a good thing. The SD 615 is known for such heating issues, like slow software this also needs to be addressed by the company as soon as possible. Coming to the talk of benchmark scores, we tested the potential power of the device with Antutu and Vellamo apps. Antutu 64-bit test revealed a score of 33907. The Vellamo app has three aspects to cover; the metal score was at 977, browser score was at 2165 and Multicore score was at 1582. We also carried out the browsing test and were pretty satisfied with the revelation. The touch response was good for Zoom-in and Zoom-out operations. The internal storage of device was around 11 GB out of the box and around 1.1 GB of RAM was free most of the time. From remaining RAM, most of it was used by the system while left out was used by apps running in the background. The device does have a microSD card support where you can add up to 64GB storage space. Moreover, it also supports OTG; we tested out both the claims and they both were true. The smartphone cameras have become an integral part of our lives; people like to capture their lives on camera and what better way to do than with their mobile handsets. 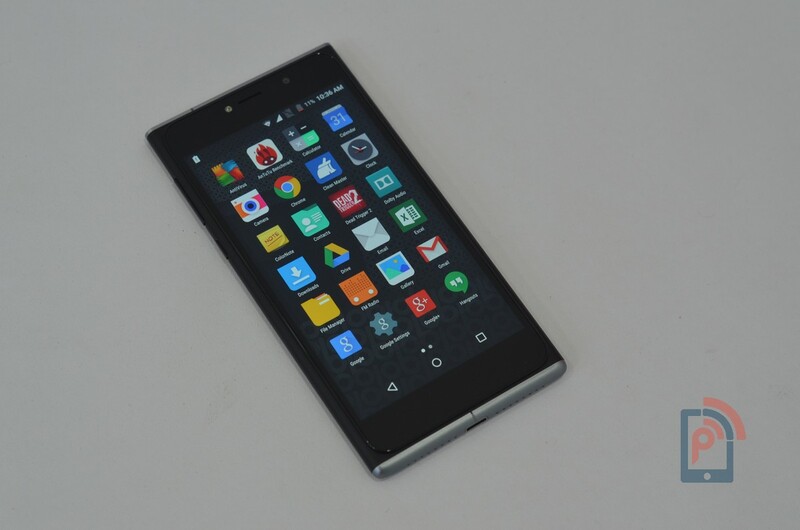 The Obi Worldphone keeps its focus on certain things, and the camera is a big part of that. The device houses a 13-megapixel Sony Exmor IMX214 image sensor, which is the most popular 13MP camera on the market, being quite affordable to the manufacturer, this image sensor was particularly in demand by many mobile vendors. Earlier this year, it was so much popular that Sony was only able to supply 50% of demand. The handsets like OnePlus One and Xiaomi Mi4 uses the exact Sony image sensor, and we know how amazing these handsets were in terms of the camera outputs. This camera module is not new and I say because it was first used on Sony Xperia Z2, but it’s one of the best in the image processing camera modules. We took the rear camera for a spin and were not surprised that the outputs would be stunning. May it be under bright light or artificial light, the captures by IMX214 looked pretty great. Though, I must admit the camera app is quite clean and intuitive. The app has multiple shooting modes with quite easy setting options. Of all the features; Refocus, Chroma Flash and OptiZoom, under IQ camera mode, my most favorite was OptiZoom. This feature mimics the optical zoom as it increases the image resolution and reduces noise, thus giving us more details than normal zooming can offer. Coming to the talk of video recording, the Obi SF1 is capable of recording videos up to 1080p with 30 frames per second rate. The quality is good quite, and it is up to the mark, though what’s missing is the OIS (Optical Image Stabilization). I would have loved that feature on this handset. Though, what’s surprising is that in the video settings there is no software stabilization either. The last thing in camera department that we have to talk is the front facing camera. The more, the merrier they say, the 5-megapixel resolution on SF1 is good enough, as it yield naturally detailed looking captures. But with front facing LED flash accompanying, you can expect to take good selfies in low light conditions as well. The battery on this device is of 3000mAh, and it is in quite a par with other mid-range devices, although, it’s quite better in capacity against most 5-inch smartphones. We expected a good Screen-on-Time (SoT) as well as standby on this handset. The brand claims that their device can offer up to 20 days standby time, 28 hours of talk time and up to 10 hours of video playback time. But there’s a catch here. We have been using the device for a week now, and we have fully charged it several times. Meanwhile, we have been using it as our daily driver and during this interval the SoT we have been getting averages around 4 hours, which is during average usage. But under heavy usage, I was only getting 2 hours 30 minutes of SoT. The maximum SoT that we got was of 4 hours 30 minutes, which is as good as it gets for average usage on this handset. It would’ve been a good feature if the company has added a normal power saving mode such as Samsung devices offer. Because a mode like that can do wonders for handsets like Obi SF1, as the SD 615 isn’t the most efficient chipset in terms of power consumption. If the company can manage a power saving mode like Samsung, then it might be a better option than underclocking the processor, which is already at 1.5GHz while the processor can go up to 1.7GHz. Addressing the fast charging claims that the handset comes with Qualcomm Quick Charging 1.0, which should charge Obi phone faster than any average Android phone. But unfortunately, our review unit didn’t have the charging adapter that would be retailing in the boxed unit so it’s hard to say that with which ampere unit the device would be giving a fast charging facility. We have contacted the company to clarify this information. You can check back later to see an update on this. Like its design and many other aspects, the Obi SF1 offers top connectivity features. Including 4G LTE network support, Wi-Fi, Bluetooth (v4.0, ATDP), A-GPS, GLONASS, microUSB 2.0 and a hybrid dual SIM slot. We tested the 4G LTE for call quality and mobile data speed; it was on par with other 4G handsets. The device supports a unique hybrid dual SIM slot where it can house a micro and a nano SIM. Many consumers worry about whether the slot on their next Android smartphone is micro or nano. Here the company is offering both, but do make a note that you can either use a nano port on SIM tray or place a microSD card slot. Either way it’s good to have choices of two SIM types on a one handset. There is no NFC, Hotknot and Infrared Blaster feature on this handset; it would have been nice to have at least one of the features. Although, we don’t actually have a use of those features. Ok, maybe IR Blaster would have been nice as it allows remote controlling of Smart TVs, ACs, etc. The mid-range segment is filled with potentially decent handsets, but there is always a void to fill. And Obi SF1 can be one such handset filling that void. If you like to explore your option from the mainstream handsets, then this can be a huge deal for you. You would be getting a stylish premium designed smartphone with best of Stock UI, a powerful processor, and a stunning display while the cameras on SF1 is an add-on. Though, there are many handsets that would be competing with this smartphone. Such as Xiaomi Mi 4i, who is the poster boy for the mid-range segment, other good specifications based handsets are Lenovo K3 Note, Asus Zenfone 2 Laser. The final say from our side is that choose the Obi SF1 if you’d like the design because similar specifications of processor and camera are available on other handsets as well.